TalkFloor's Dave Foster and I have embarked on a special #TalkFloor social media series. In addition to listening to the interviews, you can also follow us on Twitter using the #TalkFloor symbol. Not sure what a '#TalkFloor' identifier is? It's also referred to as a 'hashtag'. Simply follow along with us and you'll learn what it is and how to use it effectively. Dave's Twitter handle is @DaveTalkFloor. Mine is @cbwhittemore. Follow us. First up to be explored: Twitter. In this first interview about social media, Dave Foster and I explore Twitter to answer the questions: What is Twitter and Why Should I Care? 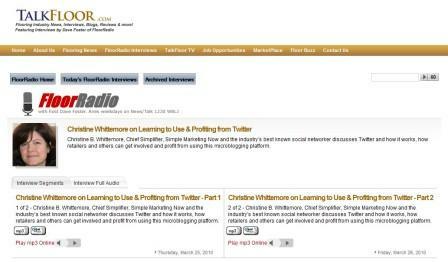 Christine B. Whittemore, Chief Simplifier, Simple Marketing Now and the industry’s best known social networker discusses Twitter and how it works, how retailers and others can get involved and profit from using this microblogging platform. This first interview consists of two segments, each approximately 15 minutes long. These are my show notes for the session. + Twitter is a microblogging platform which means that you have 140 characters to communicate a thought. As a result, succinctness and the ability to abbreviate - including shortened URLs - are highly prized! + It's easy to use via the web or on a mobile device. Yet, it's also complicated! When you first experience a Twitter stream, it almost feels as if you’re in a foreign country with a foreign language, different customs and what looks to be a lot of gibberish. If you have no one to experiment with on Twitter, it makes no sense. Twitter continues to grow. 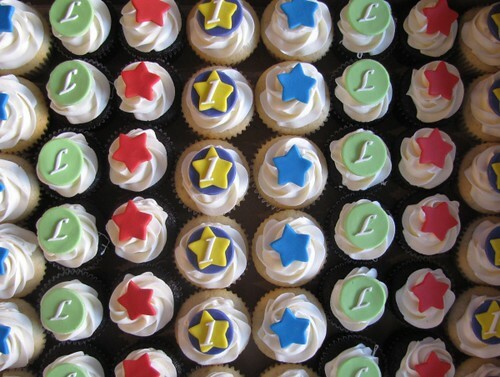 Currently, there are 75 million accounts, with an active [very active] user base of 15 million. You are hearing it integrated into the News, into conferences, and emergency relief efforts. It is a source of late breaking news for trending topics, political or global crises, disasters, and cutting edge thinking. It is searchable via search engines. Twitter represents an opportunity for you to ‘listen’ to topics of relevance to you, your brand, your business and an opportunity to interact with potential users of your products/services. It’s a research tool that leads to links to relevant articles, other like-minded thinkers, as well as collaboration. It allows you to develop a reputation for sharing information and value, and to participate remotely in events [see my writeup on participating in NeoCon via Twitter]. For me, it is a B2B tool. For other businesses, it can be a B2C tool. Using the ‘#’ symbol, you can follow related tweets. E.g., #Surfaces. See my transcript relating to Surfaces 2010. Or weekly tweet chats on a topic. E.g., #brandchat, target=new #carchat, #designchat. It is not a broadcast mechanism – unless perhaps you are Ashton Kutcher or CNN. You build followers slowly over time as a function of participating and interacting. It’s a slow consistent process. Your followers follow you because they expect consistent content from you. It is not a hard sell tool. Hard selling is considering SPAM. There are rules! For every 2-3 tweets about you, you need to come up with 7 or 8 about and for others. That can be articles of interest, inspirational quotes, retweeting content from others. Although you can use Twitter to run campaigns, it’s more effective for relationship building over the long haul – just like other social platforms. It is NOT the solution to all of your marketing and business issues. Rather it is an element of your overall strategy. It is not a one-time/static platform. You need to show up and participate to get the most benefit for your brand and business. Go to search.twitter.com and enter terms to search on. For example, surfaces, #flooring, #retailexp, your brand name. Observe what comes up. Here is the transcript from the Twitter conversation around today's #TalkFloor interview. Send me your questions at cbwhittemore@simplemarketingnow.com and we’ll answer them during the next program. Have you heard of HIMSS? It focuses on "transforming healthcare through IT" [i.e, information technology]. I hadn't until I started working with Awarepoint and discovered that HIMSS - the Healthcare Information and Management Systems Society - uses social media to promote its mission to the healthcare IT community. HIMSS recently held its annual conference on March 1-4, 2010 in Atlanta. I attended HIMSS10 and not only experienced Awarepoint's Fireside Chat with Tom Hamelin from UCSD Medical Center and heard Dennis O'Leary, M.D. 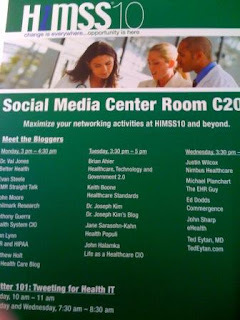 address "Leveraging RTLS for Quality, Safety, Efficiency and Productivity", but also learned how HIMSS uses social media. More specifically, via its HIMSS Facebook Fan Page, Official Facebook Group, Twitter presence and LinkedIn Group and subgroups. HIMSS' social media team, Cesar Torres, Cari McLean and Ward Seward, offered daily social media sessions as well as 'Meet the Healthcare IT Bloggers' panel discussions. I particularly enjoyed meeting Cesar Torres, manager web services for HIMSS, who has been immersed in social media for the past two years [check out his personal blog Urraca: Cesar Torres' Fiction and Machine Lore]. Cesar explained that HIMSS uses social media tools to support the HIMSS mission of bringing together the Health IT community. Social media has helped forge greater connection around the yearly HIMSS conference for 22,000 members, exhibitors and visitors as well as educate non-members about the benefits of HIMSS. Cesar spent time describing the social nature of tools like Facebook, LinkedIn and Twitter. They are about building trust and authenticity and not about sales pitches. The HIMSS interpretation of that is to apply a "30/70 approach" where 30% tweets are HIMSS related news announcements and 70% about connecting health IT leaders, extending professional relationships, educating and directing people to those who have the right knowledge. Interaction on all of these platforms matters. Welcome, respond to, acknowledge comments, tweets and conversations. After all, these are tools for relationship building [i.e., that's why they are described as 'social']. Furthermore, be ready to respond in a customer service frame of mind. You will hear about issues and concerns and need to be prepared to react [not too dissimilar from what Devon Valenti described]. 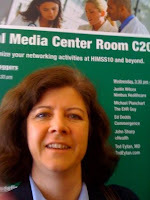 Something to point out: HIMSS has - as of 3/23/10 - over 1,700 fans on Facebook, over 4,600 Twitter followers and close to 27,000 members in its LinkedIn group [started May 2008]. These communities were built slowly over time with a focus on quality interactions starting from zero. Formal guidelines matter to prevent self-promotion. They appear prominently on LinkedIn as a featured conversation and in the welcome message new group members receive. Cari McLean actively moderates the HIMSS LinkedIn groups ensuring that discussions follow guidelines, that they truly add value and be active. As Cari has discovered, community management takes time. Yet, look at the success her active involvement has generated for HIMSS. Cari, Ward and Cesar all monitor and moderate Facebook; all three are active on Twitter. 9. Did you screw up? if yes, admit it. 10. Be a leader. Share what you're doing and create excitement. Thank you Cesar, Ward and Cari for sharing your HIMSS social media experiences, tips, steps and guidelines. I loved witnessing how relevant social media tools are for bringing together members of the Health IT community and extending the momentum around annual meetings. What are your reactions? How might you apply some of these lessons to your business or industry? BRITE '10 is right around the corner: March 31–April 1 in NYC at Columbia University. Will you be there? I will and I can't wait. I consider BRITE thought-provoking and particularly relevant given its intense focus on branding, innovation and technology. As with my Columbia Business School experience, BRITE recharges me intellectually and offers a one-of-a-kind strategic opportunity to observe and appreciate the changing technology landscape and how it relates to marketing. The BRITE ’10 conference, hosted by Columbia Business School’s Center on Global Brand Leadership, will bring together over 300 leaders and entrepreneurs from business, technology, and new media to discuss topics such as: leadership & innovation, marketing in digital media, emerging technology, and the future of media. Speakers include: Vivian Schiller (CEO, National Public Radio), Jeff Jarvis (author, What Would Google Do? ), Robin Chase (Founder, Zipcar), Devo Springsteen (Grammy-award-winning songwriter/producer of Kanye West), and Thomas Gensemer (co-founder, Blue State Digital, creators of the my.BarackObama.com network). In addition, BRITE '10 will feature a tech demo as one of our breakout sessions on Day 2 of the conference featuring: AnyClip, 5min, Alitora Systems, Kaltura, and Sense Networks. * The Early Bird deadline has been extended to Monday, March 22nd. * Take advantage of a special 25% discount code: "britefan"
You can find the full agenda at: http://www.briteconference.com. To follow the event on Twitter, use #brite10. Please let me know if you have any questions. Let me know, too, if you plan on attending BRITE '10! Believe it or not, even though Surfaces 2010 is still fresh in my mind, we've already started anticipating Surfaces 2011. Preparations are officially underway. The Surfaces Education Advisory Council met last week to review, discuss and prepare for Surfaces 2011 which will be momentous from multiple perspectives! Why? Because of several changes. First in venue. Surfaces 2011 will take place at the Mandalay Bay instead of the Sands Convention Center. For the first time ever, Surfaces will co-locate with StonExpo/Marmomacc Americas, the #1 North America stone industry event. Surfaces 2011 timing - January 25 through 27, 2011 - coincides with that of Winter 2011 Las Vegas Market. We met with the StonExpo Education Advisory Council and really enjoyed the perspectives they brought to our conversations. I anticipate the co-location creating a rich environment where retailers, designers, distributors, manufacturers and everyone in between will benefit from related surfaces [e.g,. marble, concrete, stone... in addition to carpet, wood, vinyl, ceramic, etc.] and broader perspectives relating to the environments that all of these products create. Especially since Surfaces 2010 wound up being the most fascinating Surfaces for me yet with two educational sessions, one-on-one sessions, a tour of Zappos corporate headquarters [the subject of an article in Floor Covering Weekly titled "Powered by service" in the 2/25/2010 issue and soon of a Flooring The Consumer blogpost], an incredible tour of the Encore [Carpetology blogpost coming], and marvelous meetings with friends I had, to that point, only met online. TILE Magazine editor, Arpi Nalbandian who refers to my Social Media 101 session in What Are Customers Trying to Tell You? from March 2, 2010. For the first time ever, I witnessed Twitter - via #surfaces - playing a role in the show. If you don't believe me, check out the Twitter transcript in Twitter & Surfaces 2010. I missed meeting WD Flooring, but hope to do so at Surfaces 2011 if not before. Joan Ceccarelli, Residential Interior Designer in Park City, UT, and Kemp Harr discuss residential flooring trends and Joan's role on the Surfaces Education Advisory Council. Listen to the interview to hear about current trends in the residential flooring sector and ways to keep abreast of this changing market. Thank you, Hanley-Wood, for the opportunity to provide insights on the Surfaces Education program and for ensuring that we have so much that is exciting to anticipate about Surfaces 2011! Surfaces Education Advisory Council 2011, from left to right: Jon Namba, Larry Nagle, Kelly Cooper, Joan Ceccarelli, Scott Perron, Chelsie Thornton, Mike Micalizzi, C.B. Whittemore, Kemp Harr and Paul Friederichsen. What makes you appreciate a simple pleasure? I find that the more hectic my schedule, the greater the appreciation I have for a truly simple pleasure. For example, after two hectic weeks of travel, my simple pleasure is being home. How does it work for you? What are your simple pleasures? How do they vary depending on the complexity of your day? I love how truly simple many of these pleasures are and how many are about celebrating small moments that engage the senses. PS: Don't forget to Spring Forward this weekend! Is your business on Facebook? Mine is. As a result, I'm finding Facebook becoming a really interesting environment, given the benefits that Facebook Fan Pages offer. To put Facebook into perspective, consider a few of the statistics: 400 million active users and growing strong. As of October 2009, women outnumber men on Facebook, and it's no longer just the domain of college age users. Now, though, we have research about the benefits of Facebook Fan pages. More specifically, First-of-its-kind research: Facebook fan pages are effective marketing tool, with more detail in One Cafe Chain's Facebook Experiment. Facebook can increase sales, improve word-of-mouth marketing and strengthen customer loyalty particularly among those customers engaged in social networking sites according to the research. Intriguing, don't you think? As with all social interactions, transparency and authenticity matter, as do truly offering value relevant to your audience consistently over time. Think meaningful, fresh content shared in a range of formats on a regular basis. Think product as well as promotional information. And don't forget to monitor and be ready to interact, acknowledge, welcome and respond. Social media for retailers: Focus on Facebook offers additional perspective, including "validation that social media is a viable marketing strategy when we understand what our customers want and know which social media platforms they frequent." Increasingly, that platform is Facebook. The best way, though, to benefit from Facebook and other social networking platforms is to "find out from your customers what they want... what social media sites they frequent...." and what they want. Then, deliver it to them where they are. What benefits have you noticed as a result of your Facebook Fan page interactions? Which Facebook Fan page examples have you come across that do the best job interacting and connecting with fans? Meet Devon Valenti. She is marketing manager for ALK Technologies CoPilot Live North America and manages CoPilot Live North America's social media platforms. More specifically, the CoPilot Live Blog, the CoPilot Live Facebook fan page and the CoPilot Live US Twitter account. Yes, Devon keeps busy on the social media marketing front, especially since CoPilot Live fans, followers and readers tend to be quite passionate about the brand. I invited Devon - with whom I've been working since January 2010 - to share with us perspective on how social media fits in with the CoPilot Live brand. C.B. : Devon, please tell me about yourself. I’ve been working in various marketing roles for about 7 years. One of the things I love about being a marketer is it never gets dull. There’s always a new and exciting medium that bursts onto to the scene to keep you on your toes. You need to be ready to take on these new mediums, decide if they’re right for your brand and adapt them into your marketing plans. I’ve always been drawn to the online side of marketing so when social media started becoming more popular I was definitely intrigued. C.B. : What is your role at CoPilot Live? As the Marketing Manager for North America my key focus is on growing our customer base here in North America, but I also collaborate with our global teams to integrate our marketing initiatives on a global basis. In North America specifically, CoPilot Live and GPS navigation for smartphones aren't as well known as in some of the other markets so we face some unique challenges. C.B. : Tell me more about CoPilot Live. What exactly is it? How does it work? CoPilot Live is an award-winning, full-featured GPS navigation app that runs on the iPhone, Android smartphones and Windows Mobile smartphones. CoPilot Live combines voice-guided, turn-by-turn directions with useful real-time information such as live traffic, live fuel prices and live local search to guide you on your way. All of our detailed street maps are stored on your phone—not downloaded each trip--so users don’t need to worry about getting stranded if they lost network coverage and hit a dead spot. It is a global brand and we’re currently offering version 8 of our product. C.B. : What role do you see social media playing for CoPilot Live? Social media has played a huge role in CoPilot Live’s success so far and it’s become a major area of concentration for us in all our plans going forward. Our core social media platforms—a blog, Twitter account and Facebook page— serve as a direct link to our customers and are the main way we communicate with them. One of the great things about joining the CoPilot Live team when I did was all of these social media tools were already started, pretty much everyone was onboard and believed that social media was a vital part of our marketing plans. In my situation I had the tools available; now I just needed to work on fine-tuning them to be effective for our brand. This meant really engaging customers and making sure it wasn’t always a one-sided conversation. C.B. : What have been your biggest surprises or challenges to date? I think the biggest surprise for me was to see just how fast the overall tone on our sites could change. All of the sudden all I saw were negative comments & conversations across all our sites and I was worried how this was affecting our overall brand favorability. Not only were current customers unhappy with CoPilot Live, but now when a potential customer looks at our social media sites all they see are unhappy customers, which will affect their buying decision. You quickly realize you don’t control social media! The challenge for us was to decide how to respond to our customers and address the issues they had. As a team we learned a great deal from this experience and it really pushed us to adopt a set of social media guidelines—both internally and externally. As a team we had to decide how we wanted to respond to the different types of comments, what was a reasonable response time and what was the appropriate level of information to disclose. And just as the name of this blog implies, there are many simple things you can do. Make sure to respond to every comment—good or bad. And listen to what they’re saying. They probably use your product more than you so they’re really the experts! In our case, once we started listening and responding to customer feedback, we were able to turn some of our biggest critics into are biggest fans! C.B. : What do you love most about social media? I love that it gives our customers the opportunity to interact with each other. And it happens a lot more than you think. If someone posts a question to Facebook on how to use a specific feature within CoPilot Live, most of the time another user is happy to provide an answer as well as a helpful tip on how to use it. A lot of times this leads to a conversation involving multiple users. Not only is it great to see our CoPilot Live community helping each other out, it makes our job easier as we don’t have to respond to every inquiry that comes in! C.B. : What tools do you recommend for planning or measuring social media campaigns? I have found www.tweeteffect.com to be helpful in showing how people react to the different tweets we send out. It gives me insight into what tweets gained followers and what tweets lost us followers. Also www.twitalyzer.com is a great tool for measuring your Twitter account across various metrics, such as impact, engagement, influence and clout. You can view various timeframes to identify trends and even integrate the stats with your Google Analytics account. Thank you, Devon, for sharing your experiences. I particularly love hearing how you turned your biggest critics into your strongest fans - by responding to every comment and listening to your customers - and look forward to hearing how it all progresses! 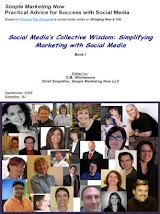 Kinnelon, NJ – Christine Whittemore, chief simplifier of Simple Marketing Now LLC, has been awarded the Inbound Marketing Certification, part of Inbound Marketing University comprehensive Internet marketing program (http://inboundmarketing.com). Whittemore, an active practitioner in social media marketing since June 2006 when she established Flooring The Consumer, her first blog, places a premium on expanding knowledge. “Given how complex and confusing the online universe is becoming especially for those just getting immersed, it’s important to be able to offer clients the confidence and confirmation that they are choosing the right partner, one who is at the forefront of cutting edge technology. 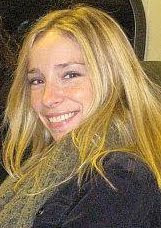 Certification is one very good way,” she says. Inbound marketing certification acknowledges proficiency in inbound marketing principles and best practices, which include engaging with visitors and customers rather than pushing information at them, and earning customer attention by providing them with valuable content that truly interests them. “The goal of inbound marketing is to create useful and pertinent content for readers, to make relevant friends by being genuinely helpful, to be attractive to both search engines and readers, all so as to convert visitors into customers. Throughout the process, it’s critical to constantly measure, analyze and improve,” adds Whittemore. The Inbound Marketing Certification covers each facet of inbound marketing [i.e., blogging, search engine optimization, social media, lead conversion, lead nurturing and closed-loop analysis) and a comprehensive certification exam. (View the curriculum.) Only 1,300 individuals have successfully passed the IMU program. For information about Simple Marketing Now, visit http://SimpleMarketingNow.com or simply contact Whittemore at cbwhittemore@SimpleMarketingNow.com. Simple Marketing Now is a marketing communications consultancy that provides organizations with the right combination of traditional marketing and social media marketing to improve the customer experience and build brand. Simple Marketing Now issues the Social Flooring Index which monitors the social state of the Flooring Industry. For more information, visit http://SimpleMarketingNow.com.